I'm sure all my fellow makeup addicts have seen photos and swatches of the new Hourglass Modernist Eyeshadow Palettes by now. Seems like they've been a pretty major fail across the board, with an unfortunate texture that's just inexcusable in such a high-end brand. But, on a happier note, I wanted to take a look at two of their earlier releases, from which much of their caché has come. 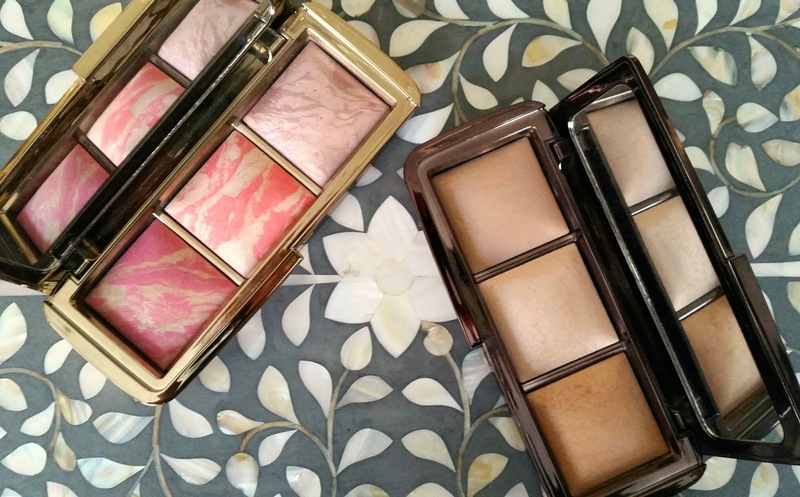 The Hourglass Ambient Lighting Palette is everything I dreamed it would be. Two of the shades, Dim Light and Radiant Light, can be purchased separately, but Incandescent Light is exclusive this this palette. They're really all lovely and I've been enjoying the palette both for its variety and compactness. Incandescent Light is my favorite, though, it works perfectly as a highlight and also manages to give my makeup a glow without looking oily when used lightly all over the face. Now, when I was making my Christmas list, that was the palette I had in mind, but one of Sephora's elves accidentally gave Santa the Ambient Lighting Blush Palette. I was aware that these blushes were pretty universally loved, and once I had it in my greedy little hands, I just couldn't part with it. Like the first palette, the middle shade, Incandescent Electra, is exclusive. The most interesting shade for me, though is Mood Exposure, a dusty plum mixed with the powder shade Mood Light. It gives my cheeks the most perfect, luminous color and the application seems to be pretty much foolproof. I highly recommend either of these palettes, if you can snag them. The packaging is pretty damn fly, too, which shouldn't matter, but we all know it does. They're a pretty penny, but they've been a standout addition to my makeup collection.